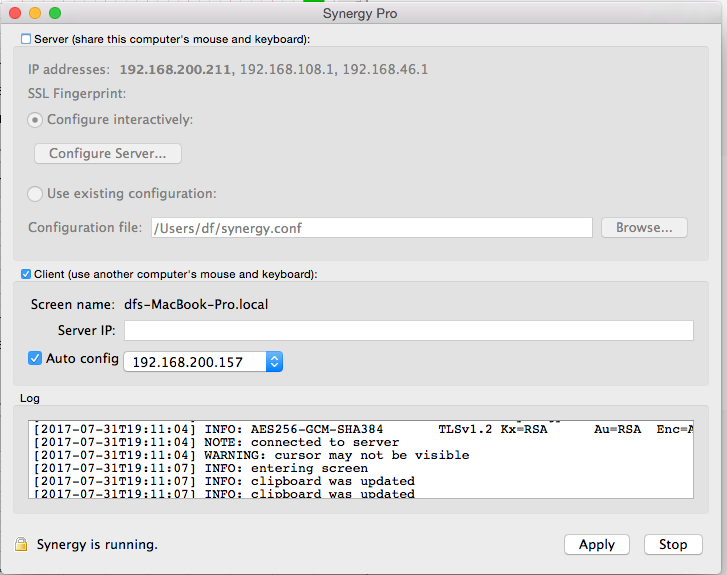 Suddenly with no changes down on computers or Synergy app, keyboard is not shared to clients. Mouse and screens are shared. 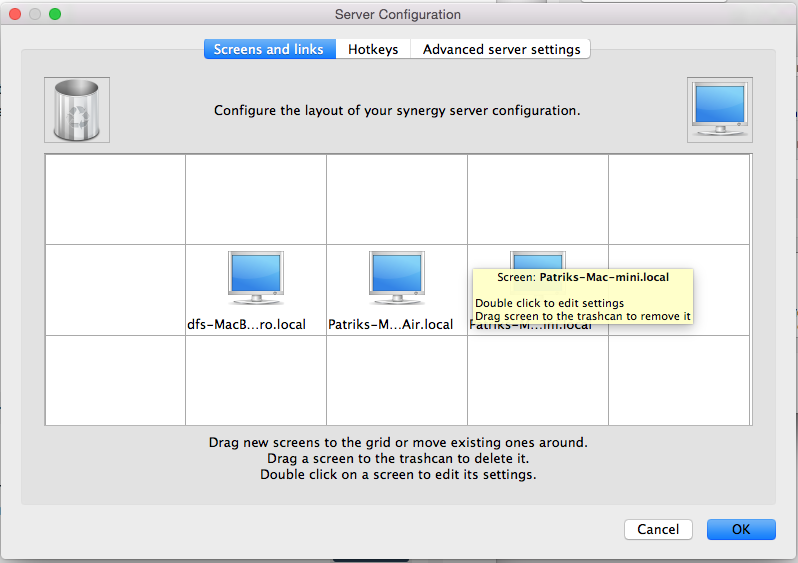 Have tried to restart Synergy on all computers. Have upgraded Synergy from 1.8.7 to 1.8.8 on all computers. Have rebooted all computers. Still doesnt work. Worked on Friday the 28th of July. Left computers on. Came back to office Sunday 30th of July and it just doesnt work. Even after doing the things mentioned above. 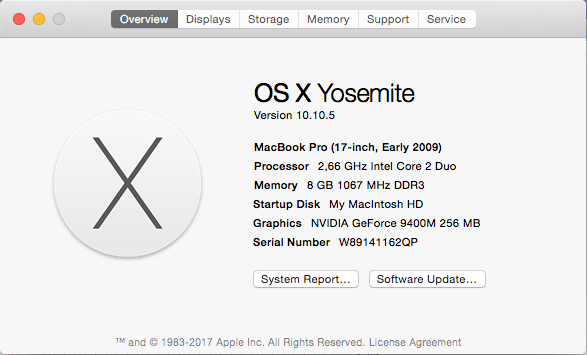 Running MAC OSX 10.10.x on all computers. Please help, this seriously affects my productivity. Flat ethernet network, all machines cabled to a switch connected on same VLAN (Switch is a deep buffer Arista 7048T). All boxes have their WLAN disabled. All boxes running in 64 bit mode. Alla running Synergy 1.8.8 (as stated in original post). To be clear, the other IPs you see on clients and server are not WiFI or Ethernet, it is VMWare VMNetworks. Can you try v1.9.0rc3 from the tagged thread below? Thanks. I will download and try this. Will be back with results. t trust this process, allow it in system settings. process, allow it in system settings. s not trust this process, allow it in system settings. ve devices does not trust this process, allow it in system settings. devices does not trust this process, allow it in system settings. es does not trust this process, allow it in system settings. does not trust this process, allow it in system settings. curred: assistive devices does not trust this process, allow it in system settings. red: assistive devices does not trust this process, allow it in system settings. [2017-08-01T18:02:41] FATAL: An error occurred: assistive devices does not trust this process, allow it in system settings. s, allow it in system settings. [2017-08-01T18:02:44] FATAL: An error occurred: assistive devices does not trust this process, allow it in system settings. [2017-08-01T18:02:45] FATAL: An error occurred: assistive devices does not trust this process, allow it in system settings. To be clear, getting the log above even if I have done according to screenshot below. [2017-08-02T09:38:35] DEBUG: opening configuration "/Users/df/synergy.confg"
[2017-08-02T09:38:35] FATAL: An error occurred: assistive devices does not trust this process, allow it in system settings. Desperate now. Need this to work. another fun fact, that even if I keep the config in screen shot 1, if I quit the synergy app and restart it, it doesnt seem to know that it has been approved and give the error according to screen shot 2. Any feedback of progress or lack there of would be appreciated! Trie to downgrade to 1.8.8 again. issue remains. Went down to 1.8.7 where I nvr saw the issue. Problem remains. Been two days since last feedback from you guys (Symless). Pls port any feedback or even post lack of feedback. Hi @Patrik Olsson! This is most likely to be a compatibility issue with that KeePassX. Please refer to Server breaks KeePass auto-type feature #4400 in our GitHub issue tracker. Ok. I didnt even know I had KeepassX until I saw it in the list... will read #4400 and report! Uninstalled KeePassX (not using it), made sure via "ps auxw" as root in a shell in my macbook air (synergy server) that no processes remains from KeePassX. Checked my Synergy clients, they didnt have KeePassX. Restarted Synergy on all computers. No success. Keyboard is still not shared. I want to remind you that it "suddenly" stopped working. It has worked weill. 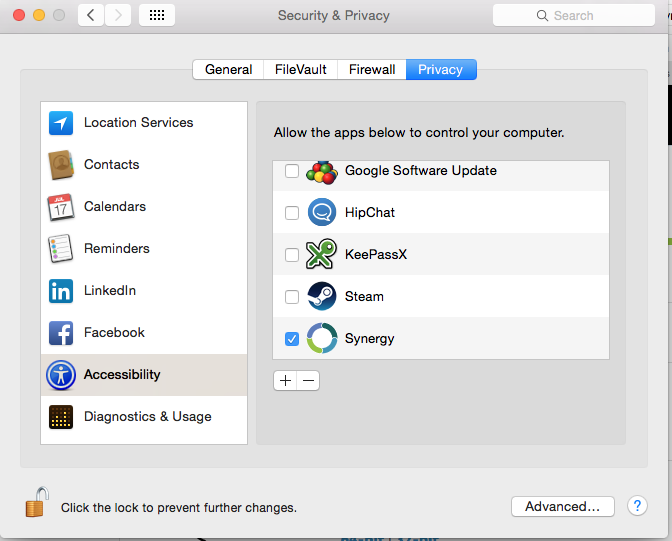 And KeepasX was installed over two years ago. Anyhow, still doesnt work with keepassx uninstalled. Can I force a dump on my server and clients for your developers? Or anything else that will give you debug data to work with? 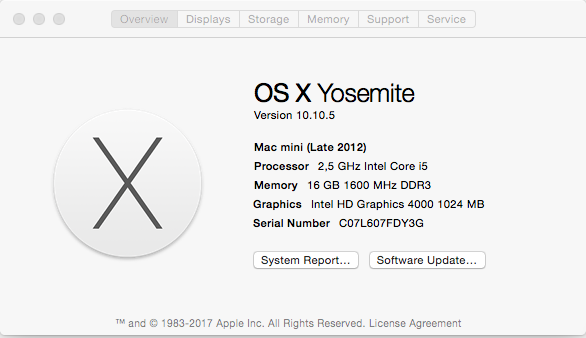 Same issue , was working and just after the update of mac os to 10.12.6 . it does not work . Can you guys try to uninstall it and re-install? What is a proper uninstall? I mean, I could delete the app and re copy to App folder. But thats pretty much same procedure as upgrade, i.e. overwriting old SYnergy app. 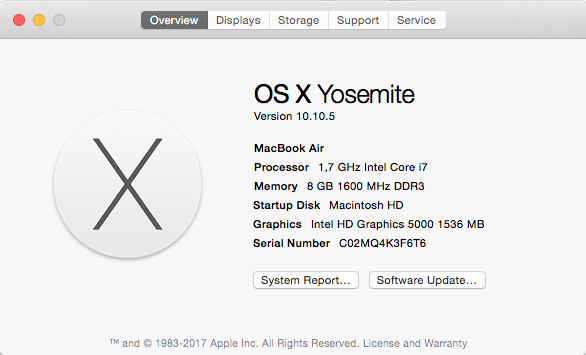 I had the same problem with Mac High Sierra as a synergy client. I tried all the other suggestion on this forum, but none of them worked.